Quick science trivia, if humans were to live this Earth in the future to search for a new home, what species will take over the planet? If you’re thinking dogs or dolphins, then you’re very wrong my friend. Recent studies show that if the randomness of things in our history didn’t led to giving obvious advantages to the hominids, octopi could have rule this planet instead of humans. Studies show that an octopus, aside from having a very flexible body structure, good eyesight, and a lot more which humans can just dream of having, it has some of the most important characteristics of humans that were key to survival and dominance. These traits are the ability to adapt to present situations and the ingenuity to do experiments efficiently. I am not making this up guys, go search this in google or YouTube, you will thank me later for the knowledge and amusement. To maintain the buildup and add more to the hype, here are some of the best traditional octopus tattoos you will ever see in the web. 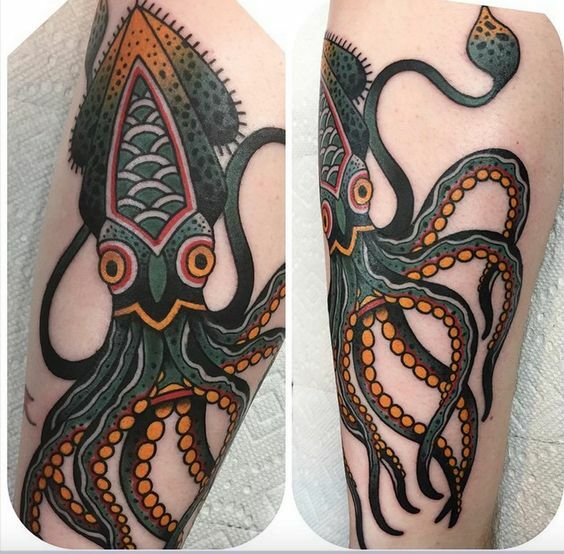 These are awesome tattoos featuring the colorful, sometimes gigantic life of an octopus. Some are based on a folklore of a giant kraken that devours the sea, while others just feature a very intelligent animal with some of its arsenal. We have 30 of the coolest and eye-popping octopus tattoos for you all of you guys to enjoy so start browsing now.